In 2013 we reviewed the first EP of Palio Superspeed Donkey. Four teenage kids who made an exuberant album, four songs, a bit naive but certainly with promise. Read our review here: http://wonomagazine.blogspot.nl/2013/01/wateramp-ep-palio-superspeed-donkey.html. So now it's 2015. Does the band with the strange name live up to its promise? That answer is simple: yes. If ever the word growth was used in the right context, it's here. 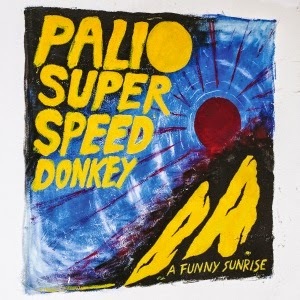 Palio Superspeed Donkey simply sort of blows my mind. Everything between The Kinks to Arctic Monkeys comes by in such a self-assured way that the word "growth" is almost an understatement. Starting with the funny single 'Obi One', of which we wrote recently that it should be in every 'Star Wars' movie from now on, A funny sunrise shoots off in many a punky, alternative, indie rock direction, where the songs are not so far behind in quality on the songs on Arctic Monkeys' debut album 'Whatever people say I am, that's what I am not'. The overbearing exuberance is lacking here, just like a song as good as 'I bet that you look good on the dancefloor'; but can you name me one other band with a first single that good? The enthusiasm of said album though Palio Superspeed Donkey has caught in all the right ways. 'Head back' attempts to get close and certainly makes the bar raised by that fantastic drumming video of a song called 'The view from the afternoon'. Not that Palio Superspeed Monkey even comes close to the tightness on aural display, but it doesn't attempt to do that. It caught the adventure and flavour and that's the strength of A funny sunrise. The band caught it in the songs, the sound, the singing, the jumpiness in the songs, the punky attitude, the snarl in the singing and the overall youthful brazenness of it all. It makes me want to get up and dance. A funny sunrise makes we want to shout, sing along and everything else that a great record does to me. What makes A funny sunrise a great record? That starts with the youthful attitude that also was on display on Taymir's debut album 'Phosphene' in the fall of 2013. The band gives it its all and mixes the enthusiasm with quality in songwriting. Songs with a punky undertone over which great melodies were smeared out. Vocal, harmonies, guitars and bass. In all the elements that make up a songs there are little things to discover. I truly like the optimism that just spouts out of all this record is made of. Punky, tough sounding or not, this is a positive album. Palio Superspeed Donkey enjoys playing its music and puts it on display in all abundance. That is something of a difference with a band like Traumahelikopter. Musically the two bands are somewhat akin, in the presentation of their music they seriously differ. Fun is allowed to shine through a lot more on A funny sunrise. That goes for the lyrics as well, where some youthful playfulness shines through as well. Erections, dumping, virginity, it all comes by. When you're this young there's enough time left to grow up. Musically there's nothing to complain. Where I really liked 'Obi One' in January, at this point in time the first single of A funny sunrise is a minor song on the album. 'Kixin', 'Cats', 'Head back', they're just some examples of songs that I truly appreciate more than 'Obi One' at this point in time. 'Better days', the Palio Superspeed Donkey kind of a ballad, even rises above that level again. In other words it is hard to point out a single song as my favourite. Just impossible. Just over a week from writing I'll go and to see the band live. More Palio Superspeed Donkey will follow on this blog soon.